Donald Trump accused his own attorney general of being “scared stiff and missing in action” as the president continued to question whether officials in his administration have acted appropriately in probing the Trump campaign’s Russian connections. “The big story that the Fake News Media refuses to report is lowlife Christopher Steele’s many meetings with Deputy A.G. Bruce Ohr” and Ohr’s wife Nellie, Trump tweeted on Saturday, referring to former British spy Steele, who wrote a dossier alleging the Trump campaign conspired with Russia during the 2016 election. [post_ads]Trump has said repeatedly that Steele’s findings prompted the inquiry that led to Mueller’s investigation, but a congressional report found it began months earlier, following a tip about George Papadopoulos, one of Trump’s political advisers. Saturday’s comments by Trump appeared to be responding to a statement by the conservative watchdog group Judicial Watch, which said it was suing the Justice Department for records of communications involving Ohr, his wife, Steele and Fusion GPS. 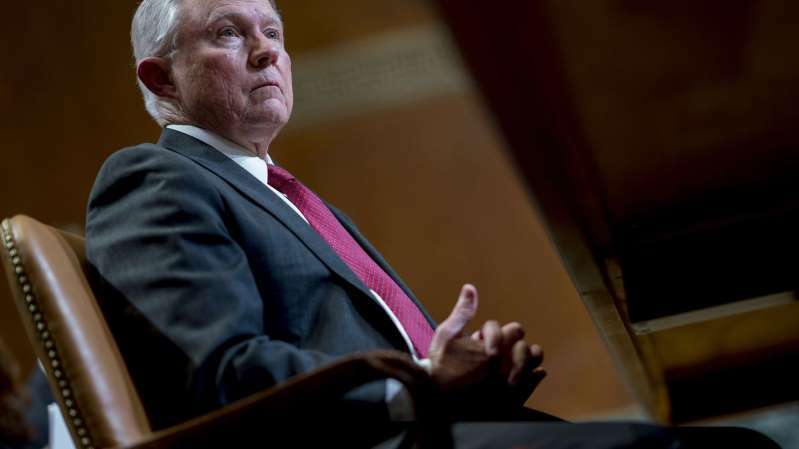 Trump has repeatedly criticized Attorney General Jeff Sessions, a former Republican senator from Alabama, who recused himself from Special Counsel Robert Mueller’s probe into Russian meddling in the election. “Sessions should stop this Rigged Witch Hunt now,” Trump tweeted on Aug. 1. Earlier on Saturday, on a rainy day at his New Jersey golf course, Trump said he may intervene to force the Federal Bureau of Investigation to turn over to Judicial Watch text messages sent by former Deputy Director Andrew McCabe. Washington-based Judicial Watch has also filed a lawsuit seeking text messages and emails of McCabe relating to his wife, a pediatric emergency physician who ran unsuccessfully for the Virginia state Senate in 2015. The actions of the former deputy director have become a frequent hobbyhorse for Trump, who’s said he believes that the Justice Department’s decision not to prosecute Clinton -- while continuing to investigate potential meddling between his campaign and Russia -- is evidence of institutional bias. The Justice Department initially denied the Freedom of Information Act request by arguing that the requested search parameters for McCabe’s communications, which included terms like “email,” “Democrat” and “campaign” -- were too broad, according to a filing by Judicial Watch. The government also said text messages related to McCabe’s wife would be shielded by personal privacy protections. Sessions fired McCabe earlier this year, days before his scheduled retirement, following months of public criticism of the FBI official by the president. Sessions said he took the action on the recommendation of FBI investigators who argued McCabe had been dishonest with Comey about his role in an October 2016 Wall Street Journal article on an FBI investigation into the Clinton Foundation.